After years out of the limelight, ferns are on their way back and are trending in 2016!! Interior styles and fashions are moving away from colour and greenery is taking centre stage – this trend also extends to weddings and event planning, so rest assured – ferns are the next best thing! Nephrolepsis is an evergreen fern native to humid forest and swamp areas throughout the world. The Nephrolepsis is a popular house plant, often grown in containers and commonly found in hanging baskets. 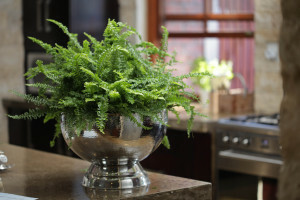 This dependable, easy-to- grow fern produces masses of long, narrow green leaves that arch and fall to create a soft, delicate indoor feature. They are particularly popular for use in bathrooms, where they thrive and tolerate the high humidity. There are many different Nephrolepsis varieties, with varying green tones, leaf shapes and styles. These include Nephrolepsis Tuffy, Nephrolepsis Fluffy Ruffles, Nephrolepsis Boston Gold or Yellow Boston. Nephrolepsis has recently been recognised amongst the top ‘air purifying’ plants. 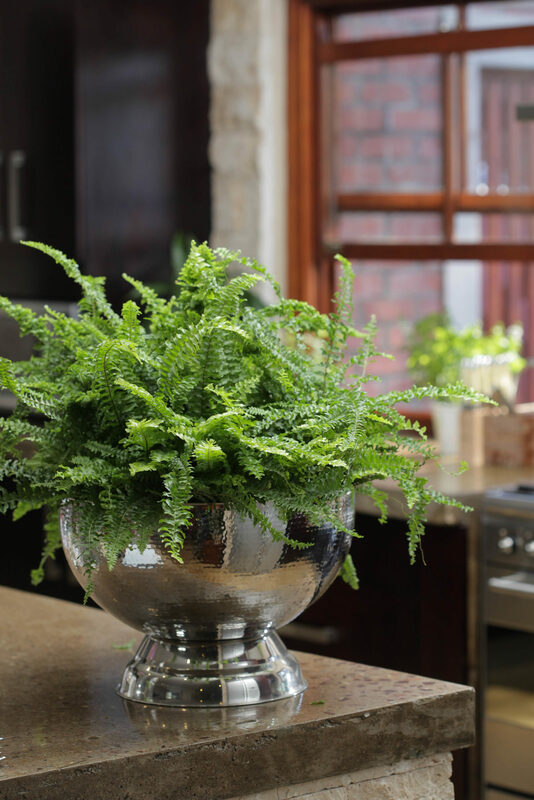 Recent studies have proven that indoor plants remove unwanted toxins from the air – and as such, ferns don’t only look good – they ‘do’ good too! Nephrolepsis is one of the easiest ferns to grow indoors. Position in a bright light area without direct sunlight. (Ferns can tolerate lower light areas for a few weeks at a time, but should then be rotated to ensure best growth). Normal room temperatures are suitable all year round, during summer and in extreme hot periods the plant will benefit from mist-spraying or stand the plant in water to increase humidity and re-create more natural growing conditions. Regular watering is required. This may vary between 2 to 3 times a week in summer, right down to once a week in winter. Ensure the roots never dry out!! Ferns can be grown in the garden and are popular as they establish quickly and spread easily to form a dense groundcover in shaded areas. Please enquire at your local garden centre for advice when planting ferns outdoors, as some varieties have recently been flagged as being invasive. Ferns are frost tender and may die back completely in the cold. They do however recover and bounce back in spring.